V4 revolution: The Panigale V4 replaces the iconic 1299 at the top of the Ducati supersport range, doing so by enhancing performance and ridability so that riders of all skill levels can enjoy boundless fun and excitement. 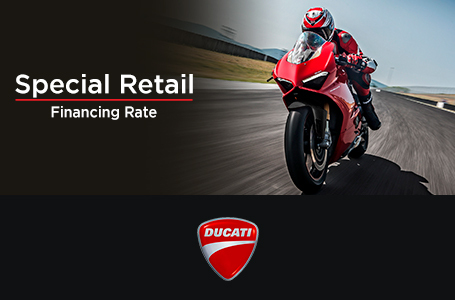 The Panigale V4 has been developed in close collaboration with Ducati Corse, drawing directly on know-how and technology from the racing world to provide a road bike that is the closest thing possible to its MotoGP counterpart. The character has taken shape: Elegant, muscular, technological. This is the essence of the style of the new Panigale V4. The Ducati Style Centre gave shape to the character of the bike and its performance following what for Ducati are the canons of Italian sports elegance: large and soft surfaces interrupted by few bold marks. Component integration, the idea of power and functionality have become dominant elements of the style and of the whole project. V4 di 90°: the racing soul: The new Desmosedici Stradale engine has been designed based on the experience gained in MotoGP. The typical approach used in competitions is found in the extraordinary power and torque values: the 90° V4 with a displacement of 1,103 cm³, the counter-rotating crankshaft and the 4 valves per cylinder with desmodromic distribution that reaches 214 hp (157.5 kW ) of maximum power at 13,000 rpm and 122 Nm (12.44 kgm) of maximum torque at 10,000 rpm. Last generation electronics: The performance of the Desmosedici Stradale must always be easily manageable to achieve maximum racing results, optimising the energies and concentration of the rider. The new Panigale V4's control electronics use the six-axis inertial platform data (6D IMU) that make it possible to capture and record extensive amounts of information. 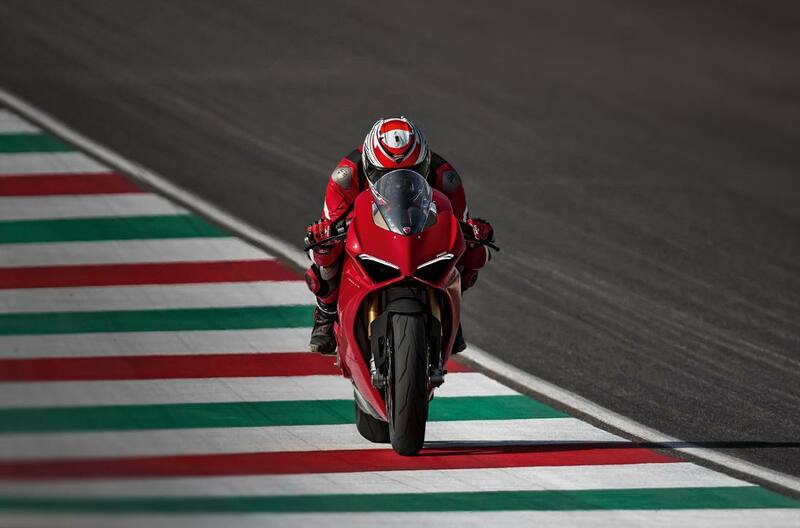 Safety: The new Panigale V4 sets new absolute performance benchmarks and raises vehicle safety and dynamics control standards with a state-of-the-art electronics package that maximises the potential offered by Bosch's six-axis inertial platform. Other original controls have also been introduced, like controlled slides during braking, ABS Cornering that acts only on the front brake with a setup that was designed specifically for track riding, and Quickshift Up & Down with a strategy that takes into account the lean angle. 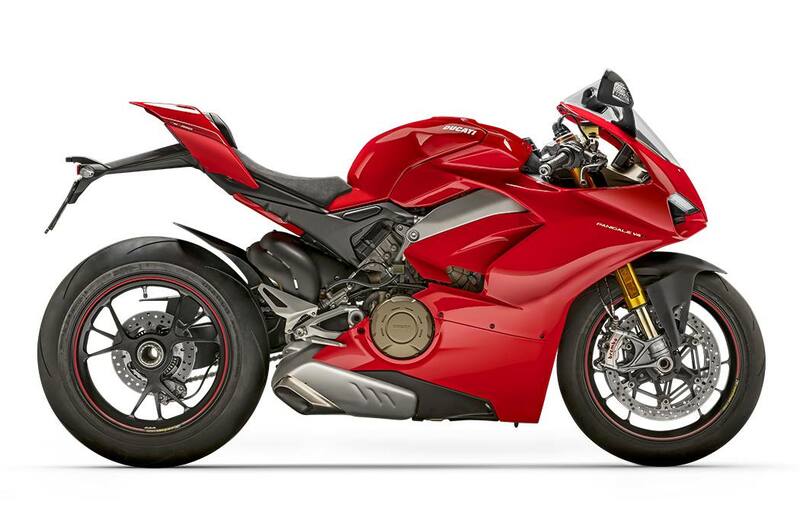 Panigale V4 S: The S version is equipped with refined Öhlins suspensions with Smart EC 2.0 system and top-level components like aluminium forged rims and lithium-ion battery. Frame: Aluminum alloy "Front Frame"
Front wheel: 3-spokes forged aluminum alloy 3.50 in. x 17 in. Rear Wheel: 3 spokes forged aluminum alloy 6.00 in. x 17 in.